One-fourth of the 1968 Olympic Games gold medal-winning USA 4×100 meter relay team, Ronnie Ray Smith died on March 31 in a Los Angeles hospice, three days after his 64thbirthday. “Ronnie Ray Smith was one of the greatest sprinters in the 100 and 220 in our era,” says his former San Jose State teammate Kirk Clayton, one of the many greats of the two-decade Speed City Era from the mid 1950’s through the 1970’s. Mr. Smith stood out singularly whether he was racing down a track straightaway or collectively mastering the turn on a sprint relay team. Mr. Smith could be called a “third-leg” specialist in the sprint relay, one lap around a track whether the distance is measured in meters or yards. His job would be to run the curve of the track with speed and power and be in the lead when the final member of a relay foursome would seamlessly accept the baton and race to the finish line for the victory. Besides Olympic Games gold medal, he has a NCAA Championship to back it up. In 1968, Mr. Smith was one of several men to tie the 100-meter dash world record time of 9.9 seconds. He did it in Sacramento, four months before he would etch his name into the record books again for the 4×100 meter relay world-record setting, Olympic winning time of 38.24 with USA teammates Mel Pender, Charlie Greene and Jim Hines in Mexico City. “Ronnie Ray was a great example of the (Coach) Bud Winter San Jose State sprint philosophy. He was a beautiful runner to watch. He had the good arm and high knee action. When the gun went off, he had the ‘Rocket Start’ and he was a very relaxed runner. Ronnie was very good at maintaining his form to the finish,” says Ron Davis, the Spartans’ current cross country and women’s track coach who was Mr. Smith’s classmate in a 1968 English class at San Jose State. Both Davis and Clayton described Mr. Smith as quiet or unassuming. Davis said that Mr. Smith was a different person once he stepped on to the track. In many photos, Mr. Smith’s trademarks were the baton in hand and a laser-like focus behind his dark sunglasses. “Ronnie Ray did not see the limelight. He was a ‘hard hat’ type of guy. He just did his job. He was a man of substance. That’s how it worked out,” says Mr. Clayton of the 5-foot-8, 160-pound sprinter. Mr. Smith was one of four San Jose State track athletes to win a gold medal and set world and Olympics Games records in the process in Mexico City. Tommie Smith, no relation to Mr. Smith, was the 200 meters gold medal winner. Lee Evans won gold medals in the 400 meters and the 4×400 meter relay for the United States. The four goal medals earned by San Jose State athletes in men’s track and field were more than every other competing country in the sport except for the United States’ 15. The Soviet Union and Kenya won three gold each; Australia, East Germany, Hungary, and Romania, two. Yet, Mr. Smith, one of seven San Jose State Olympic Games gold medal winning athletes in history, is probably the least known of the 1968 quartet of San Jose State Olympic Games gold medalists. Tommie Smith and bronze medalist John Carlos, also of San Jose State, were banished from the Games after their raised clenched fist salute on the medal stand. Evans’ sign of solidarity for the Human Rights movement was to wear a dark beret after winning the 400-meter dash. According to Mr. Clayton, Mr. Smith majored in sociology and earned his bachelor’s degree from San Jose State. Most of his adult professional life was spent as an employee of the Los Angeles Park and Recreation Department. For Mr. Smith, it was home as a graduate of Manual Arts High School and Los Angeles City College before he made his way north to San Jose State. His prowess on the track was obvious early. At Manual Arts, he was clocked in 9.5 in the 100 and 21.2 in the 220. Besides Olympic Games fame, Mr. Smith was a major contributor to San Jose State’s one and only NCAA Men’s Outdoor Track and Field Championship. 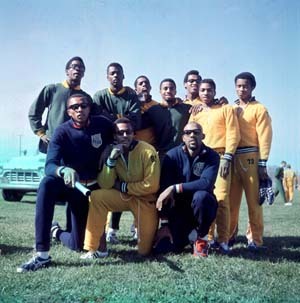 Despite their dominance and world-renowned notoriety as a track and field power, the Spartans’ championship did not come until 1969 in Knoxville, Tennessee. Mr. Smith finished third in the 100 and took the baton from Mr. Clayton for the third leg of the 440-yard relay for what would be the winning and NCAA Championship meet record time of 38.8 seconds after Mr. Carlos crossed the finish line first. “We lost a beautiful human being. That was the kind of person he was,” says Mr. Davis of the San Jose State University Sports Hall of Fame member. “He left this world satisfied with who he was, who he had become, what he accomplished and where he was going,” says Mr. Clayton, who was with Mr. Smith when he passed away. San Jose State is adding a Women’s Track & Field team later this year. They need to bring back the Men’s team as well. Afterall, it’s the sport that put SJSU on the national athletics map. Go Spartans! I have wonderful memories of running for the SJS Cross Country and Track teams in the fall of 1966 and Spring of 1967. Got to watch and run with an incredible bunch of athletes until I broke a bone in my foot. Never could understand SJS ending it’s Track program. Baffling. As I was middle distance, I didn’t run with the sprinters – but watching them work out was as good as if being allowed to play the role of Luke Skywalker in Star Wars. RIP Ronnie Ray.